My July Gourmet Body Treats review and giveaway went over so well, that they offered to send me August’s box AND another chance for my readers (that’s you!) to win a box of their own! Yay! If you’re not aware, Gourmet Body Treats is small, family-owned beauty/cosmetics company dedicated to providing quality products that are not only effective, but also 100% cruelty-free. Okay, let’s see what was in August’s box! First look! 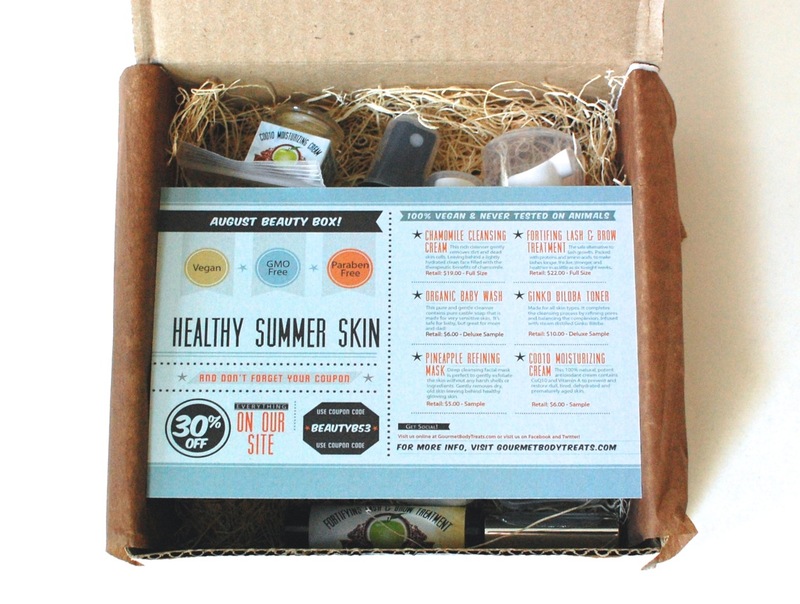 The theme this month is “Healthy Summer Skin” and features products to help keep your skin looking fresh and clean. Another great box from Gourmet Body Treats! I love that I don’t have to worry about reading the ingredients because everything in the box will always be 100% vegan. Plus, the value is great. All totaled, the items in August’s box comes to $68! Crazy! Once again, Gourmet Body Treats has kindly offered to send one of my lucky readers their very own Gourmet Beauty box! Just enter via the Rafflecopter below! Disclosure: I received this box for review purposes. I was not compensated in any way. All opinions are my own. Post may contain affiliate links. Giveaway open to US residents only, 18+. Prize fulfillment to be handled directly by Gourmet Body Treats. Winner will have 48 hours to respond to confirmation email and claim their prize. If I don’t get a reply, a new winner will be chosen. I would love to try to the face mask. I’ve never used one before because my skin is really sensitive, but you make taking a bath with one sound so relaxing and trust me, I need some relaxation lol. I also love the idea of the Dead Sea clay. The flash and brow treatment! I would love to see how this works! The natural lash and brow treatment sounds nice. Oh my gosh! I want one so badly! Lol.. Great review! All of the products look amazing but I’d most like to try the lash and brow treatment. I’ve been meaning to try out more brow products and love how this brand made one that can be used on eyelashes too! The lash & brow treatment. Mine are so thin & sad! I would want to try the Fortifying Lash & Brow Treatment. My eyebrows could use it. I would love to try the chamomile cleansing cream. Chamomile is so soothing. Everything looks amazing, but I would be most excited for the lash and brow treatment! It’s so hard to find products like that without harsh chemicals! Love this sub box, will be subscribing. This is such a great idea still kind of a newbie vegan and still looking for some great natural organic products. The brow treatment! Even though I took off all but the front stubs of my eyebrows as a rebellious 14 year old, I still pride in my drawn-on brows! They are my favorite part of my face, so anything I can do to UUUMPHF them up is an automatic winner in my book! I’d love to try the pineapple refining mask! The pineapple refining mask sounds fun to try! I would love the Fortifying Lash & Brow Treatment best; I would love to try this! I would most like to try the pineapple refining mask. This looks like an awesome line of products! I’d love to try almost everything! My kids aren’t babies anymore so I’d probably swap the baby cleanser with someone, though. That pineapple mask sounds heavenly. I would love to try the chamomile cleansing cream. Thanks for a great giveaway. It all looks great but the Organic Baby Wash is my fave!